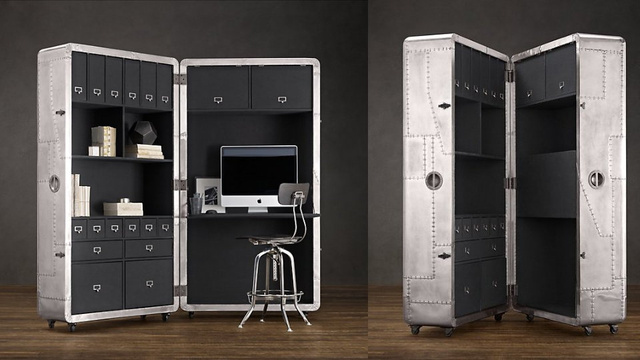 Blackhawk Secretary Trunk Is An Office In A Case | OhGizmo! This made the rounds back in March, and we missed it. Shame on us, because the Blackhawk Secretary Trunk is pretty badass. It’s a six foot tall case that contains everything necessary to setup an office. Think of it as a giant road case (like those from travelling rock shows), only wrapped in pre-stressed aluminum and rivets, to give it that mid-20th century aircraft look. The “pre-stressed” part just means they banged on it to artificially age it and make it look like it’s been to a few places. Truth be told, at 525lbs, there’s no chance we’re going to actually, you know, go anywhere with it. But we sure as heck wouldn’t mind decking out our headquarters with these… if only they didn’t cost $4,295.